Causality is the million dollar question of science and life. If you don’t know what caused what, you don’t have any strong arguments to make. What was first; “the chicken or the egg” is the question everyone is trying to answer. In my opinion, trying to find the causality is overrated. It doesn’t really matter whether it was the chicken or the egg. And you can’t or don’t need to always pinpoint to cause of something. In this blog I will explain the reasons why I make this argument. I will use random examples, and personal experiences and will relate these to scientific practices. Let’s say that my employer wants me to eat more fruit, in order to work and be healthy. Thus, he hands me free fruit during my break at work. I receive the fruit, eat it, and become healthier. In this situation, you might say that the employer caused me to eat fruit. His intervention worked. However, there are many other reasons (causes) that should be aligned before I am eating fruit. I must like the fruit, the fruit should be ripe, I shouldn’t have brought fruit myself, I should trust my employer, and eating fruit should fit in my break time. There are several, if not many, causes that make me eat fruit. You might question whether all these other reasons may not be causes as well. These other reasons are called moderator variables in statistics. Although, these variables aren’t valued as causal variables, they are causes for me to eat fruit or not. However, if my employer did not give me any fruit, then the other variables (like the ripeness) were no causes, they wouldn’t exist. Thus, real causation does exist in this situation. But the moderating variables are just as (or a little less) important, and could be seen as little causes as well. If your employer hands you fruit it is necessary that there are many things in line before his action is successful. I believe that it is more appropriate to view his effort for me eating fruit, as a chain of little causes instead of one single cause. At the start, “giving fruit” and “eating fruit” are two separate variables. But I believe that over time, these two become interconnected. At the start, “giving fruit” is the causation, but if I eat the fruit every time (and enjoy it very much) the causation becomes affected by it. If my employer sees me enjoying the fruit, he will keep offering me fruit during every break. If I stopped eating it, he would probably stop offering it. Thus, in some way the causation is dependent on the effect. The effect (me eating fruit) causes my employer to give me (more) fruit. Over time, you won’t know which variable was the causal variable anymore. This story becomes the “Chicken and egg example” what was first? Well I argue, that it doesn’t really matter what was first, because they are interconnected now. They respond and adapt to each other and are therefore dependent on each other. The challenge for the employer and the employee is to get exactly what they need from each other. If my employer learns very well from my responses, then he will change his fruit-menu. For example, if he only sees me eating red-fruit, it would be wise to only offer me red fruits. In that way, I would eat more and more fruit. In (classical) research, the causal variable hardly adapts to the response of the effect variable. Therefore, the effects are often less successful. You might see this as the fact that the interconnection between the cause and the effect are minimal. In machine-learning the output variable is (often) put back in the algorithm and therefore it can learn and adapt faster. Therefore, using machine-learning to find effects is very effective. I would like to call this effect “interconnection” but I don’t know whether some definition like this exists already. With conditioning, two separate variables which aren’t related to each other, seem to be related to the perceiving party. The most well-known example it the Pavlovian dog, where the dog responded to elicit saliva when a bell rang. The bell and saliva have nothing to do with each other, but they are indirectly related. The variable “giving of food” was related to the bell and to the eliciting of saliva. I believe that this effect happens in our daily life as well quite often. Our life is very repetitive within the days, weeks, months, and years. Our body and mind have automatic responses to our normal routines. When your usual awakening time arrives in the morning, your cortisol (instinctively) rises although you might not even plan to wake up at your usual waking-time, your body is conditioned to do that. Same accounts for your mind, often when I am together with friends I like to cook extensively to make a nice meal. However, when I am alone, I cook more simple (but healthy). At the start, this ritual might have depended on the fun of cooking together but over time this has become a ritual. But now, I automatically think of extensive recepies when I am with friends, I don’t really think of the “fun of cooking” anymore. Just like a real ritual, there are often no good/conscious reasons to perform them, they are part of a larger pattern. Thus, over time I have conditioned myself to respond to several situations and made it a ritual. The actual causes became less and less important over time. Over time, the two variables became interconnected. With three arguments, a chain of causes, interconnection, and self-conditioning I showed that causality is overrated in our life. Life is very complex and many variables relate to each other, and influence in each other resulting in interconnection and self-conditioning. I have no clue of the strength of interconnection and self-conditioning within people, but I am sure it is present. Just look at all the rituals each culture has. It would be interesting to quantify the strength of it somehow. In my life, things are quite heavily interconnected (see this blog). If we look at two positive correlated variables, I imagine that both variables attract each other and ultimately reach a point of interconnection (or close to). There are many other variables in life (not shown in this figure) that can affect this relation and stop the spirally process. 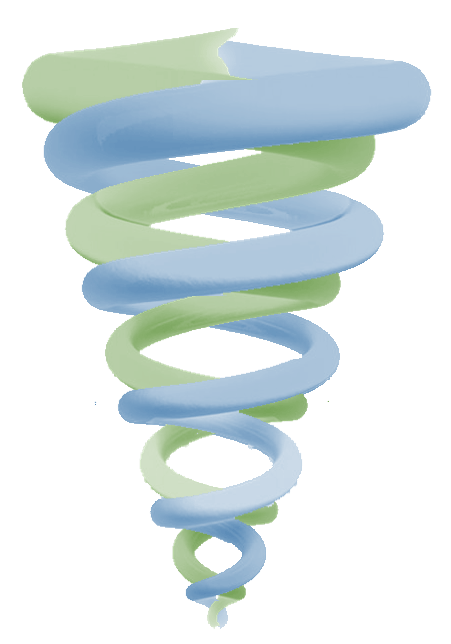 However, if the spiral doesn’t get interrupted then a very long spiral of interconnection will be the result (in my theory). I believe (and I am not the only one (link)) who thinks that depression, addiction, emotion-eating, self-esteem, and many other processes are patterns where the spiral isn’t interrupted. Therefore, this behavior becomes (increasingly) self-destructive over time. Secondly, many of the variables in life become attracted towards this spiral, and become aligned towards the same point within the spiral. Your friends might be one example. If you become a (crack-)addict, you are more likely to meet or find people who are okay, or even stimulate your addiction, and lose the friends who are not. Having only friends around that support your addiction, makes it harder to get out of your addiction. Thus, when many variables in life become aligned towards one point, the spiral increases its strength and is harder to get out of. Most methods in science don’t take into account that different variables influence each other over time what results in the spirally process of behavior. Scientific experiments are often short and effects like interconnection etc. are very hard to measure quantitatively. However, we know that this is happening. Life works different from science. Changes in our lives, thoughts over time and many other aspects of life aren’t that well studied. With Quantified Self and new technologies like machine-learning it is possible to perform more adaptive, and therefore more successful studies. Machine-learning techniques can use methods that cause interconnection. I believe interconnection is a very strong part in our life and therefore I am sure that machine-learning will become very relevant for our (future) life. Self-awareness of these processes, early notifications, and (spiral) prevention can make us more in-tune with our feelings and can make us avoid certain patterns that we would otherwise fall for. An interesting topic Justin! Philosopher have long debated what causation actually is, and what is means for something to cause something else. I agree that we, and scientists, use the word too easily. Isn’t 2) more accurate of what you are describing? A and B can be background variables, such as “the fruit is ripe” and “Justin likes to eat fruit”, and when you add C: “Justin is offered fruit by his employer” you get D: “Justin becomes healthier”. Thank you for your response and your thoughts on this topic. Concerning your remark, you are right about this. A chain of causes wasn’t the best title for this example. I changed the title of this paragraph. Nevertheless, a chain of causes (like you demonstrated in 1) could also be an example where causality could over- or underrated as well. On who or what can we attribute causality? On A for B, C and D, OR on A for B, and B for C, and C for D?